The worst is yet to come for the global banking system, which faces potential losses of more than half-trillion dollars from investments in toxic sub-prime US mortgage debt. “The problems in the financial sector remain with us,” said Bank of England chief Mervyn King on Nov 19 th . “A painful adjustment faces the global banking sector over the next few months as losses are revealed and new capital is raised to repair bank balance sheets,” he said. To defuse the crisis, the Fed, the European Central Bank, and the Bank of England are pumping enormous sums of money into the banking system, at below market interest rates, to prevent a “credit crunch” from triggering a global stock market meltdown. “Central banks are working together to forestall any sharp tightening in credit conditions that might lead to a downturn around the world,” King declared. Big banks are reluctant to lend money to each other in the LIBOR market, because of suspicions that borrowers might be holding big undisclosed losses in toxic sub-prime mortgages. Global banks are also hoarding cash against future losses that must be written off their balance sheets in the year ahead. As a result, banks must borrow money at interest rates that are at multi-year highs. It also means that central bank rate cuts are not passed on to individuals and companies. US bankers are so afraid to lend money to each other, that they prefer to park their excess cash in “safe haven” US Treasury bills and notes, even at negative rates of return, after adjusting for inflation. The fear factor in the banking system is measured by the TED spread, which is the difference for yields on US$ Libor rates (ie Eurodollar rates) and for US Treasury bills, of comparable maturities. Since August, there have been two eruptions in the TED spread that lifted Eurodollar rates to +220 basis points above 3-month Treasury bills rates, the highest since the 1987 stock market crash. Both eruptions coincided with sharp downturns in the S&P 500 stock market index. The Bernanke Fed is aiming to narrow the TED spread, by injecting $80 billion into the banking system, on a temporary basis, while the ECB and BoE inject big doses of euros and pounds into the markets. The Fed says the special injections of cash isn't a money giveaway, and must be paid back within 28-days. But traders must be on constant alert, “watching closely” if the Fed rolls-over the 28-day loans into “coupon passes” in the future, a stealth operation that increases the money supply on a permanent basis. Confidence is also lacking in the European Libor market, and inter-bank Euro lending rates (ie Euribor) shot up to 4.95% last week, a six-year high, far above the ECB's loan rate of 4.00 percent. 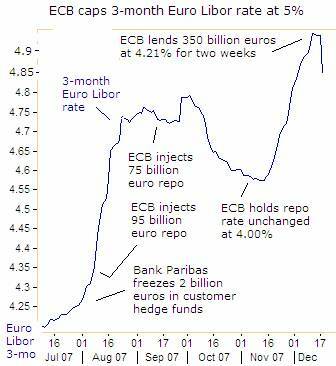 On Dec 18 th , the ECB put a lid on the Euribor market, by injecting a whopping 350 billion euros ($500 billion) for two-weeks, almost 170 billion euros more than was needed for year-end funding. By opening the floodgates, the ECB knocked the 3-month Euro Libor rate 15 basis points lower to 4.80%. But as BoE chief King pointed out, a lack of cash is not a problem for banks, but rather their reluctance to lend money to each other. “Banks are worried that the impact of their reluctance to lend will lead to a sharper slowdown in the United States . That concern is a serious one, because it does hold out the prospect that there will be a self-reinforcing downturn in credit and activity,” he warned. The Bank of England lent 10 billion pounds ($20.2 billion) on Dec 18 th , knocking the 3-month sterling Libor rate 45 basis points lower to 6.20 percent. Still, that left an 70 basis-point gap between sterling Libor and the BoE base rate, compared with a 32 basis-point gap at the start of the year. Earlier this month, the BoE cut its base rate by a quarter-point to 5.50%, stoking higher inflation, with the UK 's M4 money supply expanding at 11.8% clip, four times faster than its economic output. The massive injections of liquidity by the central banks, come at a time when inflation is rearing its ugly head across the globe, led by sharply higher food and energy prices. Central bankers are intellectually dishonest about food and energy prices, routinely subtracting the “essentials of life” from their inflation equations, and reckon that commodity price spikes are self-correcting, due to the laws of gravity. In the Euro zone, sharply higher food and energy prices boosted the consumer inflation rate to 3.1% in November, the highest since 2001. Eurostat manipulates the inflation numbers, yet reported energy prices 9.7% higher, while food, alcohol and tobacco prices were up 4% in annual terms. In Germany , inflation was 3.3% year-on-year, and France and Italy up 2.6% each. In Slovenia , inflation jumped to 5.7 percent. It was also high in Spain 4.1%, and in Luxembourg , at 4.0 percent. The ECB is sitting on its hands, and doing nothing about it. “I will not say that we are in a wait and see attitude,” said Belgium 's central banker Guy Quaden on Dec 13 th . “In fact, we are monitoring the situation very closely. We are seriously concerned and permanently alert. Central bankers, even the best ones, cannot prevent an increase of oil prices or other international commodities. What they have to do is to prevent contagion, the development of so-called second round effects,” he said. 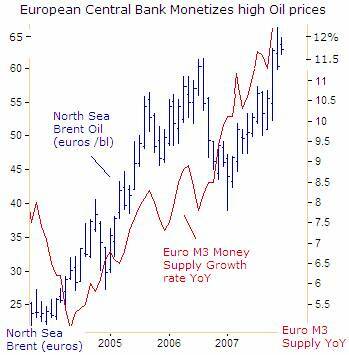 Contrary to Quaden's brainwashing gibberish, the European Central Bank has been monetizing the soaring cost of energy, by inflating its Euro M3 money supply at a 12.3% annual rate. That's five times faster than the growth rate of the Euro zone economy, thus stoking higher inflation. On Nov 24 th , the ECB's Juergen Stark noted a stronger Euro /dollar had blunted some of the rise in raw material prices. “Nevertheless, we are seeing, despite the Euro's appreciation, a rise in import prices that will have an impact on the inflation rate,” he admitted. Under the leadership of Jean “Tricky” Trichet, the ECB has veered far away from its monetarist roots, and the original 4.5% growth target for Euro M3, the maximum growth rate for stable inflation. 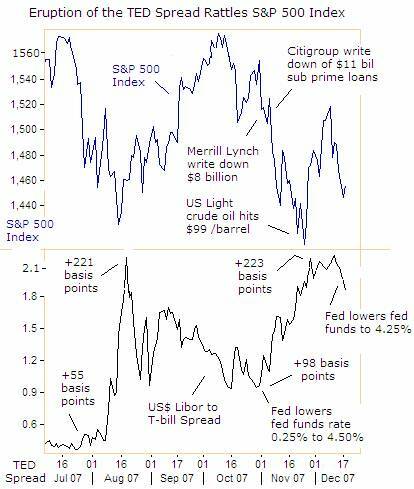 Milton Freidman once remarked, “Central bankers always try to avoid their last big mistake. So every time there's the threat of a contraction in the economy, they'll over stimulate the economy, by printing too much money. The result will be a rising roller coaster of inflation, with each high and low being higher than the preceding one,” he warned. Stark said the ECB wouldn't react to the dangers of higher inflation, if they are “first-round effects” linked to sharply higher oil and food prices. “The inflation bump may have become higher and wider, but it remains a bump. It is important to avoid second-round effects. That means we will only react swiftly if wages are rising strongly, as a result of higher raw materials prices,” Stark said. “The ECB's credibility in fighting inflation would help to insure that what should be a temporary rise in inflation, caused by higher commodity prices, is not reflected in higher wage demands and consumer goods price rises,” declared ECB chief “Tricky” Trichet on Dec 19 th . 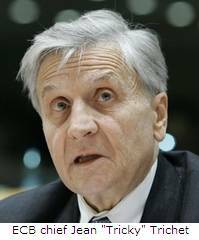 When asked to identify the ECB's top priority, either defusing the credit crisis or fighting inflation, Trichet replied, “The response is very clear. We are alert and everybody must know that we will do whatever is needed to deliver price stability and be credible in that delivery. The single needle in our compass is price stability.” But such empty rhetoric, not backed up by action, quickly dissipates into thin air. Less than 48-hours after pumping a whopping 350 billion Euros into the banking system, Trichet appealed to European workers to resist the temptation to demand higher wages, so they can stay ahead of the higher cost of living. Otherwise, the ECB would punish workers demanding higher wages, with higher interest rates. But in the book, “The Monetary History of the United States , 1867–1960,” Milton Friedman and his co-author Anna Schwartz argued that higher wages don't cause inflation. “Inflation is always and everywhere a monetary phenomenon. As the government increases the rate at which it prints money, the result is too much money chasing too few goods and services. And just as higher wages don't cause inflation, the whopping oil price increases between 1973 and 1980 didn't cause the stagflation, - a stagnant economy with rising inflation. Rather, the oil price hikes were the form inflation took” from rapid money supply growth, Friedman and Schwartz argued. Trading in foreign exchange is akin to judging a reverse beauty contest, trying to pick the least ugly currency, amid an array of inflated paper confetti. If the Euro is strong against the US dollar, it's only because the ECB is inflating its money supply at a slightly slower rate than the Fed. Since Ben “B-52” Bernanke got his hands on the money printing presses 18-months ago, the growth rate of the US M3 money supply has doubled to 16%, the fastest in 41-years. “The leads are long and variable, though the more inflation a society has experienced, history shows, the shorter the time lead will be between a change in money supply growth and the subsequent change in inflation,” Friedman observed. If Friedman's time projections are off target this year, it's probably due to the manipulation of inflation statistics by government apparatchniks. 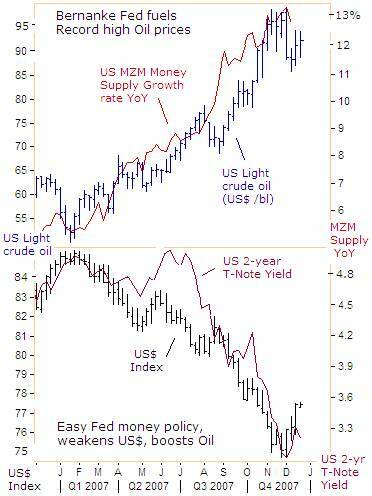 Since the beginning of this year, the growth rate of the US MZM money supply has expanded from 5.5% to an annuaized 13% in December, greasing the skids under the US dollar index, which tumbled to a 20-year low last month. In turn, the weaker dollar jettisoned US crude oil prices towards $100 /barrel. Oil prices have stabilized around $90 per barrel, after wiping out the Iranian war premium, and are bolstered by depleting US commercial oil supplies at 297 million barrels, a 3-year low. The explosive growth of the US money supply might hit 20%, on par with India and South Africa , in response to the Fed's rate cutting campaign since mid-August. Most remarkably, the Fed is considering further rate cuts, even after US wholesale prices soared 3.2% in November, the biggest jump in 34-years, to an annualized gain of 7.7%, led by the essentials of life - food and energy. US consumer prices were 4.3% higher in the 12-months to November, the most since June 2006. Sharply higher food and energy prices haven't inhibited the Federal Reserve from cutting interest rates so far. Before embarking on its latest easing campaign, Fed chief Bernanke explained on July 10 th , “If inflation expectations are well anchored, changes in energy and food prices should have relatively little influence on inflation. Inflation is less responsive than it used to be to changes in oil prices and other supply shocks,” he told a stunned audience at the National Bureau of Economic Research. He continued, “If inflation expectations are low and firmly anchored, then less urgency is required in responding to the inflation threat posed by higher oil prices. In this case, monetary policy need not tighten and could conceivably ease in the wake of an oil-price shock,” Bernanke said. It's also interesting to note, that rookie Fed governor Frederic Mishkin, prematurely declared victory in the war on inflation on Sept 27 th . “Inflation has come down in the old-fashioned way. Tighter monetary policy and a commitment to price stability by central banks throughout the world have led to lower inflation and an anchoring of inflation expectations,” Mishkin said to a dumbfounded audience. Then two months later, with oil prices bumping against $100 /barrel, Mishkin said, “The recent high level of overall inflation reflects rapidly rising energy prices that the Federal Reserve obviously cannot control. It is always important, not to overreact to a rise in oil prices, but actually to think about what is going to happen in the longer run. Any attempt to bring overall inflation down too quickly would entail large losses of output and employment,” Mishkin said on Nov 13 th . Yet the Fed needs to pay greater respect to the “headline” measures of inflation that include food and energy. The USDA lowered its projection of soybean stocks to 185 million bushels, down 68% from last year at this time and only 6% of annual usage. That means at the end of next August, the US will have only 23-days of soybean inventory left in the bins scattered around the country. Soybean futures are up 75% this year, to $11.50 /bushel, a 34-year high, related to crude oil by the bio-diesel connection. Corn is hovering near $4.50 per bushel, a 10-year high. Unilateral Fed rate cuts, not matched by the inflationist ECB, narrowed the US dollar's interest rate advantage over the Euro from 147 basis points to zero this year, driving the US dollar lower, and lifting grain prices higher. 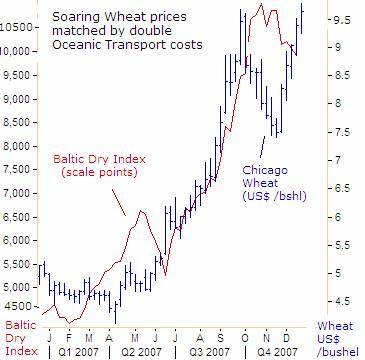 A weaker US dollar makes American grain prices less expensive to buyers abroad. US wheat exporters already have sold more than 90% of the 1.18 billion bushels the US Department of Agriculture expects will be exported during the whole marketing year, which ends in June 2008. Fearing a further rise in prices, India , Pakistan , Egypt , Morocco , Algeria , Indonesia and Iraq have all booked large quantities of wheat, and have been snapping up cargoes. The US Department of Agriculture has also cut its estimate of world wheat stocks for 2007-08 to 112.4 million tons, a 30-year low. If sustained, sharply higher wheat prices will eventually work their way into the grocery aisle for bread, cereal, cookies and other products. Overseas buyers are in a panic, anticipating the US will run out of wheat, and that prices will have to increase to ration the remaining supply. And since wheat, corn and soybeans are used to feed livestock, as those costs go up, so does the retail cost of beef to consumers. Food prices rose at a 4.1% annual rate in the three months ended in November largely due to higher milk, egg and meat prices. British supermarket prices have climbed 14% over the last year, adding 750 pounds to the average family's annual grocery shop. 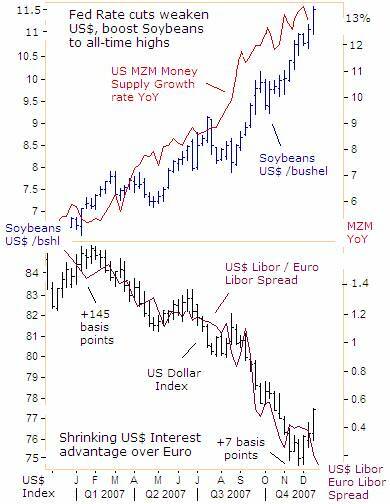 And it's not just the Fed's weak US dollar policy that is driving up agricultural prices to record highs these days. Growing Bio-fuel demand has pushed up corn and soybean prices. Furthermore, the cost of transporting dry goods such as coal, iron ore, and grains overseas, as measured by the Baltic Dry Index, have doubled since January, to all-time highs. Higher transportations costs, by land or by sea, are expected to be passed along to the final consumer. The cost of shipping Middle East crude oil to Japan has soared by 500%, because the supply of two-hulled very large crude carriers, or VLCCs, that could be available for hire at the region's ports within the next 30-days has suddenly dropped to 22 from 43 in September, Bookings for super tankers sailing from the Middle East to Asia account for 47% of global demand for the carriers. 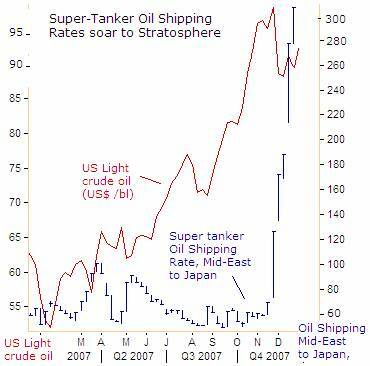 Shipments to the US , the second-biggest market, account for 14% of demand for supertankers. On Nov 30 th St. Louis Fed chief William Poole was asked if Fed rate cuts might be viewed as a bailout of Wall Street banks. “I wouldn't want people in the markets to believe that I would be so concerned about the moral hazard argument, that I wouldn't possibly advocate a 25-basis-point or a 50-basis-point cut or whatever might be on the table,” Poole told reporters. 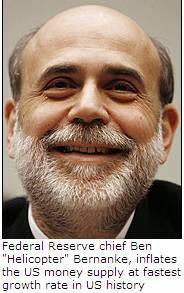 Unfortunately, ordinary US citizens will pay for the Fed's bailout of Wall Street, with the stealth tax of inflation. Mr Poole said he relies on the Treasury inflation-indexed bonds as the best indicator of consumer price expectations. “Inflation-indexed bonds show essentially no significant change in market-inflation expectations. 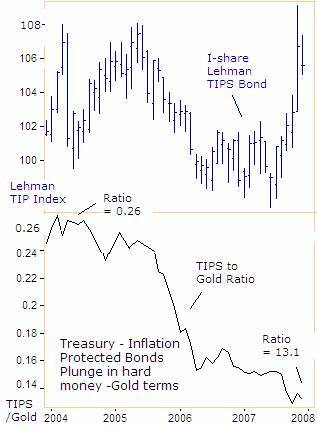 I don't think there is any indication that they have changed.” The I-share index for the Lehman TIPS Bond has recovered to levels that prevailed three years ago, suggesting stable inflation expectations. But when TIPS are measured in “hard money” terms, against an ounce of gold, TIPS are 50% lower at 13 cents on the depreciating US dollar. Still, the Fed never ceases in its effort to brainwash the public and confuse traders, with its propaganda machine. Richmond Fed chief Jeffrey Lacker tried to dupe his audience on Dec 19 th , “There has been a drift up in inflation expectations since the early part of this year. It certainly adds a bit to my inflation worries. It has not been precipitous, so I don't think the Fed's credibility has been eroded,” he said. In hindsight, an investor would have been much better off owning gold, rather than inflation indexed US Treasury bonds this year. Gold is up 28% and is consolidating its spectacular gains around $800 /ounce. Gold enabled investors to stay ahead of the US dollar's devaluation engineered by the Bernanke Fed, and hit all-time highs against currencies in Australia , Canada , England , Japan , and elsewhere. The paper-currency system is badly abused by “intellectually dishonest” central bankers, and is leading the global economy to hyper-inflation in the years ahead. Interestingly enough, the same sophisticated bankers who bought $1.8 trillion of toxic sub-prime US mortgage bonds over the past few years, are now locking in yields on government IUO's below the rate of inflation, and shunning gold. But the yellow metal is the ultimate “safe haven” during the biggest banking crisis since the Great Depression, and protects purchasing power from hyper-inflation. 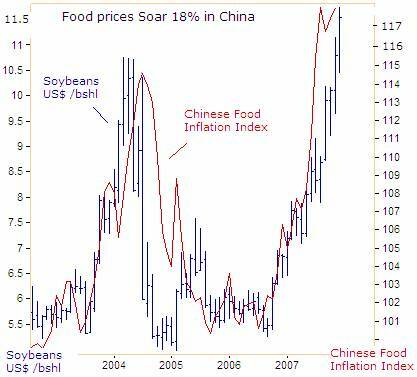 Food prices are 18% higher in China from a year ago, and the Communist kingpins in Beijing , fear that runaway inflation could ignite social unrest. “We're facing a grave situation,” said Ma Kai, the country's top planner. “Given the tightened food supply in the international market, a decline in domestic grain production could lead to more price hikes,” said Song Tingmin, VP of the China National Association of Grain. China has a fifth of the world's population, and 1.3 billion people using 7% of the world's farmland. Zheng Guogan, head of the State Meteorological Administration forecasts global warming will cut China 's annual grain harvest by up to 10 percent. That would mean about 50 million tons less grain in the current tight supply situation and a potential for further food inflation in world markets. A surge in food prices pushed China 's consumer price index to an 11-year high of 6.9% in November, far above the government's upper target of 3 percent. In the past, Beijing tackled food inflation by boosting imports from abroad, but this strategy won't work with record high prices for grains and rice in world markets. Citing the need to “stabilize inflation expectations”, Beijing ordered domestic banks to increase their cash reserves by 1% to a record 14.5%, draining 350 billion yuan of liquidity. One percentage point moves might become the standard size of Chinese reserve ratio hikes. So far, China 's tightening actions have been carefully calibrated to simply drain the excess capital flowing into the country from foreign trade surpluses and foreign investment. But Beijing has warned that it will shift its monetary stance “from prudent to tight in 2008,” in order to clamp down on inflation. The inflation that is biting China has been in the pipeline for many years, since the Chinese central bank inflated its M2 money supply at 18% per year for most of this decade, in order to prevent the yuan from rising against the US dollar. If Chinese central bankers make good on their vow to tighten the yuan supply next year, it would spell bad news for Chinese banking profits and the Shanghai red-chip market. 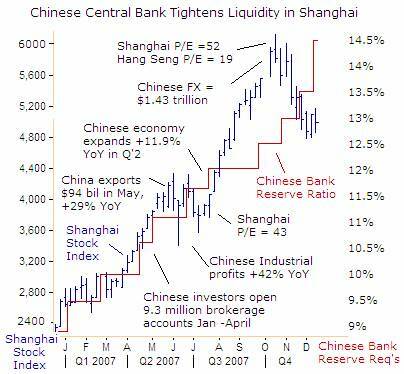 Still, a healthy dose of skepticism prevails, since Chinese authorities have a long track record of broken promises on curbing liquidity. But on Dec 20 th , The People's Bank of China surprised the market, by lifting one-year deposit rates by 27 basis points to 4.14%, and the one-year lending rate by 18 basis points to 7.47 percent. “This move is to help prevent the rapidly expanding economy from boiling over and price rises from turning into conspicuous inflation,” the central bank explained. One-year yuan certificates of deposit now earn 4.14%, just a shade below the US federal funds rate of 4.25 percent, and more monetary easing from the Federal Reserve, coupled with a tighter Chinese money policy, is expected to put upward pressure on the yuan versus the US dollar. It's another signal, that Beijing will engineer a stronger yuan to help keep raw material imports costs down. On Nov 5th , Fed governor Mishkin said the central bank must be ready to take back some rate cuts quickly, if it overdid its policy medicine. “If, in their quest to reduce macroeconomic risk, policy-makers overshoot and ease policy too much, they need to expeditiously remove at least part of that ease before inflationary pressures become a threat,” he said. 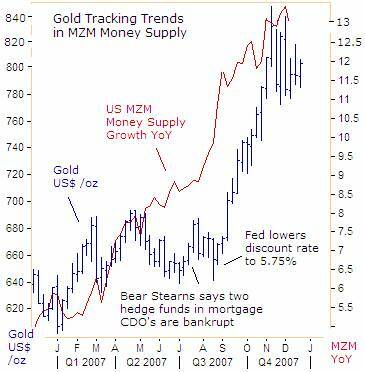 Wouldn't now be a good time to stop the rapid expansion of the money supply, before the US economy gets stuck in the Stagflation trap? “Money is too important to be left to central bankers. You essentially have a group of unelected people who have enormous power to affect the economy. I've always been in favor of replacing the Fed with a laptop computer, to calculate the monetary base and expand it annually, through war, peace, feast and famine by a predictable 2%,” said Milton Friedman, who passed away on Nov 16, 2006. Wishing everyone a happy, healthy, and prosperous New Year! Insightful analysis and predictions of the (1) top dozen stock markets around the world, Exchange Traded Funds, and US home-builder indexes (2) Commodities such as crude oil, copper, gold, silver, the DJ Commodity Index, and gold mining and oil company indexes (3) Foreign currencies such as, the Australian dollar, British pound, Euro, Japanese yen, and Canadian dollar (4) Libor interest rates, global bond markets and central bank monetary policies, (5) Central banker "Jawboning" and Intervention techniques that move markets.